We’re running a contest, and for a buck (all of which goes to the Animal Refuge League), you can enter to win a pot of gold! Yes, gold. Well, what gold is to some dogs that is. 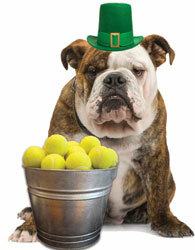 Our pot o’gold is a bucket of brand-new, dog-friendly, fuzzy, bouncy tennis balls. And we’re giving one away in each of our two stores (Fetch and the Fish & Bone in Boston). All you need to do is stop by either store anytime during the month of March 2012 and buy a chance (each chance costs $1) to guess how many there are in this bucket (pictured) of tennis balls. Easy you say? Well we tried to figure it out in advance by computing the volume of the bucket, and dividing by the volume of a tennis ball, and even though we’ve got all the dimensions we weren’t even close. So guess away! Buy as many guesses as you like, $1 a piece. Every dime of the proceeds go to a local animal shelter or animal care fund. Every dime from the contest at Fetch goes to the Animal Refuge League of Greater Portland. Multiple correct guessers will be put in a random drawing, with one winner drawn for each store at the end. The winner gets all the tennis balls in the pot. Anyone is welcome to buy a guess, other than employees of Fish & Bone or Fetch and their families. May the luck of the Irish be with you! Well there’s one good thing about the New England cold spring seasons, and it’s that bugs lay dormant that much longer. As soon as the temperatures climb, it’s time to figure out your plan for flea and tick prevention. All dog owners should be thinking about heartworm prevention too. Heartworm preventative works retroactively remember; it kills any larvae that exist in your dog already. Many of us only give heartworm preventative during the warm months (looking backward one month, the daily temperature is 70 degrees or above). If you don’t use a year round heartworm preventative you’ll want to schedule an appointment with your vet for a heartworm test, and you can pick up the preventative at the same time. As far as fleas and ticks, you’ve got some choices to make. At Fetch/Fish & Bone, we try to help you support your pet’s health holistically first, and if that isn’t what you are looking for, then (in the world of flea and tick prevention anyway) we have the big guns for you as well (Frontline and Advantix). However, keep in mind that a chemical product all by itself often doesn’t work! For flea and tick prevention, whether you go all-natural or chemical, you really need to think in terms of multiple layers of defense. Best defense is to use as many layers as possible. All of the products mentioned below (except for diatomaceous earth) are available in our stores, over the phone, and within a month or two, on Fish & Bone’s new website. Second layer: Supplement a healthy base diet with an anti-oxidant rich vitamin, mineral and essential fatty acid supplement that will further strengthen the immune system (you should actually be adding this to your pet’s food year round); and with a supplement specifically designed to repel fleas and ticks. Essential fatty acids are important to protect skin cells, which are irritated by flea bites. Many times the ‘itch’ is caused by an allergic reaction to a flea bite, rather than the fleas themselves. Help minimize the itch by lubricating the skin cells from the inside out. The EFAs in fish oil are ‘long chain’ fatty acids, and are better absorbed by dogs than flax oil. Don’t bother with capsules unless you can’t get your pet to take fish oil straight; remember, you are paying for that extra step of making the gel caps. And with oils, you get what you pay for. Cheap oils may be heavy with mercury and PCBs, and they can be rancid or oxidized from exposure to too much heat in transport or storage. Rancid oils smell bad; never use an oil that smells bad. For my dog Zip, I use Wholistic Pet Salmon Oil or Nordic Naturals Pet Cod Liver Oil. Why those two brands? Because both companies are clear about the purity and handling of their oils. Neither are fishy-smelling. The Wholistic Pet is more viscous, and it’s pink; the Nordic Naturals is clear and a little bit thinner. Prices similar. I love both companies. Local- and regional-vores, Wholistic Pet is a New Hampshire company J. This is our first year selling Earth Animal’s Healthy Powder (also in tablets, and yeast-free Herbal Powder) but I am expecting great results. Dr. Sue & Bob Goldstein, the vets behind the label, have been holistic vets for a long time. Their Healthy Powder shifts the blood chemistry (B vitamins, selenium) to not only support the immune system but also to make the blood ‘bitter’ to biting insects. I’m using the Healthy Powder on Zip too. Third layer: choose a potent natural flea and tick (and mosquito too while you are at it) repellent. Ingredients like neem, eucalyptus, rosemary, erigeron, rose geranium, cedarwood and tea tree oil are some of the active ingredients to look for. My go-to repellent is Quantum Herbal Products because they are very clear about their manufacturing process (6 month distillation of essential oils), and they are so un-marketing oriented. I’ve been using it for 10 years now. It’s also highly recommended by Dr. Martin Goldstein (you may have seen him on Martha). Ark Naturals, and Buzz-Off are also great picks. I’ve just brought in Earth Animal’s flea and tick repellant, and I trust it’s as good as Quantum unless I hear otherwise. Most products will last a couple of days between application, but I always re-apply, especially to legs, neck, belly and hindquarters, before walking in high grass or in woods. Or the Shoo Tag, which alters the magnetic field around your pet (or you…there are Shoo Tags for people too) to repel fleas, ticks and mosquitoes. Seriously. We brought in the Shoo Tag based on customer testimonial; and, there’s a guarantee on the tag. If you are not satisfied for any reason, you can return it to the manufacturer for a full refund (one per household). I’m going to try one this year. Fourth layer: Shampoo as needed with a natural flea and tick repelling shampoo, or use your usual shampoo and follow with a natural spray or an herbal dip like Cloud Nine by Halo. Soapy water removes fleas and their eggs, and kills them by washing them drown the drain. Be careful about shampooing too often as that can cause more itch by drying out the dermis. Fifth layer: monitor the situation by brushing and flea combing regularly. You will see how well your flea and tick prevention plan is going by penetrating the coat, and you can physically remove any fleas and ticks. You’ll need a few good tools: a brush and comb, and tick remover. Everyone absolutely needs a flea comb. It doesn’t have to be anything fancy. The teeth need to be extremely tightly spaced though, and it helps if the comb is stainless, or white or pale in color, so that the little black buggers will show up easily. Ticks, too, are tiny before they have eaten and become engorged. Brush thick coats first, outside preferably, or in the garage. It’ll be easier to follow up with the flea comb. When flea combing it’s a good idea to have a bowl of soapy water nearby. After every pass of the comb, dunk it in the soapy water. Why? Because the soap changes the surface tension of the water, and the fleas will fall in the bowl and drown. If you come across an attached tick, use a tick remover tool rather than tweezers. The tweezers can leave the head intact, and you want the whole tick to come off your animal. Once you have removed the tick, if you are concerned that it might be a deer tick carrying Lyme’s Disease, you can save it in a ziplock baggie and send it to Maine Medical Center’s Disease Lab for testing. Sixth layer: wash pet bedding often in hot soapy water, and vacuum more than usual. When vacuuming, you can place an inexpensive chemical flea collar in the vacuum bag to kill any ticks, fleas or eggs that have been sucked up; otherwise, you will need to throw away the bag each time to ensure you aren’t providing a nice spawning ground for parasites in your vacuum. Seventh layer: Line thresholds to outside doors, and the perimeter of warm, moist rooms like the bathroom (which fleas prefer) with diatomaceous earth. DE is made up of the skeletons of diatoms (one-celled creatures). The skeletons are microscopically thorny, and they puncture the exoskeletons of all kinds of insects. Once the buggers have come in contact with the DE, they slowly dehydrate and die. It’s not a quick fix, but it does interrupt the life cycle; and it’s safe for allergic households. If you use DE, be careful not to shake it into the air; it can scratch the esophagus if inhaled. You can buy DE at natural gardening centers. I’m a fan of Timothy Ferriss. He’s a radical self-experimenter with a sense of humor and a basher of popular assumptions. Some people can’t stand the guy but I think they must just be envious; who wouldn’t be? Regardless I wouldn’t have expected to come across Pottenger‘s cat study in his new book. Pottenger studied the efficacy of synthetic hormones in cats whose adrenal glands had been removed for that purpose (he was making the hormone, and needed to see how well the hormones worked in keeping the cats, glands removed, alive). By chance, he started feeding some of the labratory cats raw meat/bones/organs/connective tissue. The basic diet was the same for all the cats: meat (raw or cooked), milk (raw or pasteurized), and cod liver oil. The only (and, it turns out, very significant) difference in their diets was the raw v. cooked. The raw-fed cats thrived; the cooked/pasteurized-fed cats had high rates of death, disease, and infertility. The one important aspect that doesn’t always get mentioned when the study is quoted, though, is that taurine, which a cat can’t live without, is heat-sensitive. So the cats with the raw diets had a big leg up over the other cats simply by virtue of having their taurine needs met. This wasn’t known at the time of the study (early 1900s). Nowadays pet food manufacturers add the taurine after the food is cooked, and there are oodles of cats that seem to do well enough on a high-quality canned or dry. But this study is worth looking into. I’m going to order the book from Longfellow Books next. Definitely deserves a place on the shelf. Probiotics & Enzymes…do I need to add them to a raw diet? Living foods, from plants or animal sources, contain enzymes (but they are wiped out by heat beginning at 110 degrees…so cooked food does not contain active enzymes) . The body, human or animal, manufactures enzymes. But as we age, our store of them and our ability to make them gets depleted. And they’re important not only for digestion but for immune system response, and to catalyze all kinds of chemical activity in the body. I believe enzymes, and proper digestions, might behind the vitality you see in a really healthy person or animal: ask what they eat, and I would bet 9 times out of ten the diet has a huge raw component. Think of the opposite of Morgan Spurlock after a month of eating only at McDonald’s (‘Super Size Me’). Remember his girlfriend, the vegan chef? Who brought his liver back to health at the end of the documentary? Probiotics are the ‘good’ bacteria. They help with digestion and they maintain balance in the digestive tract. They even kill the ‘bad’ bacteria. My pancreatic pug Zip will always get enzymes (and probiotics) added to any food he’s given, simply to lighten the load of his pancreas (which secretes enzymes to break down protein and fat). I take enzymes and probiotics too, even though I eat a lot of raw food, because I’m getting older and I think it helps me get the most benefit out of my diet. But do you really need to add these supplements to a pet’s raw diet? For the first month of a raw diet, yes, I think you do. The body needs time to produce the enzymes it needs for this new regimen. Though the raw food itself contains enzymes, the load on the body to digest the new ‘material’ will be eased (as will your pickup duty) by sending some backup enzymes down the hatch. And then after 4-6 weeks, most animals will be fully transitioned into the new diet. But because you will be rotating among different proteins in the raw diet (you will, won’t you? ), keep those enzymes and probiotics (sealed, at room temp, for max potency) for the next change in diet. And dogs don’t have the ability to break down cellulase, which is found in the cell walls of fruit and vegetables. So if you aren’t pureeing the carrot your dog loves to chomp, it won’t do any harm but he won’t get the nutrients trapped inside either. Unless you add an enzyme mix containing cellulase. For some quick straightforward questions & answers, read the FAQ page on Prozyme here. There’s some controversy over whether or not enzymes make it through the acid bath of the stomach to the small intestine. Steve Brown writes in See Spot Live Longer (along with co-author Beth Taylor) that enzymes are designed for the environment where they do their work; so an enzyme destined to break down protein in the stomach has the ability to withstand the acid. This article I found on the web (not on Prozyme’s site) says that Prozyme will withstand the stomach acids. Interesting stuff; to be continued. Comments welcome. I went to a dental talk at a reputable neighboring vet’s office last fall. It was actually a sales pitch for annual anesthetized dental cleanings. I have a real fondness for vets; I absolutely believe that they are drawn to their profession for love of healing animals. But I disagree openly with the ones who routinely recommend Science Diet, or who over-vaccinate, or prescribe steroids or antibiotics as a first response to symptoms like scratching or vomiting or ‘leaking’, or who categorically trash raw bones. Raw bones are controversial. As a raw feeder, and someone who sells natural pet foods, I’ll never gloss over controversy. I provide resources and information, and my customers can decide for themselves what to buy and feed. My dog in fact has pancreatitis, and can’t tolerate the fat in marrow or in chicken skin, so I don’t feed him raw bones anymore. I don’t even feed him closely trimmed bones because I’ve seen an acute pancreatic episode, and it’s not worth the risk. So I don’t tell my customers that all dogs must be fed raw bones. But, most dogs don’t have pancreatitis, and all dogs need to chew; and further, dental health doesn’t just happen in the modern dog world of biscuits and kibble and cans without some plan in place. So I do generally recommend raw bones. But I’ll never say ‘don’t ever get your dog’s teeth cleaned by your vet’. I wish vets who are inclined toward categorical stances would, for the benefit of animals everywhere, soften their language and concede controversy (rather than implying, or outright stating, that there is only one valid points of view: theirs). I wondered, why did the vet not mention the risks of putting your animal under anesthesia yearly (and didn’t mention, either, the cost of this treatment)? And further, why is it that vets who sell foods like Science Diet don’t mention that feeding your animals an exclusively highly processed food whose ingredients list starts with by-products and fractionated grains (grain, usually corn, then slips under the radar as the #1 ingredient) can cause obesity, diabetes, food allergies, irritable bowel syndrome, myotoxin poisoning, kidney disease, and dental problems. Not to mention the nightmarish food recall lessons we learned in 2007. When I refer to bones, I’m not just referring to beef marrow bones, which can be too hard for some aggressive chewers who won’t give in (they are the ones who are likely to crack a tooth); I’m referring to turkey and chicken backs and necks and wings, and fish bones (from whole raw fish), and knuckle bones, and bison/buffalo/elk bones. When you see the dental benefits of a reversal of severe tartar to white teeth (I’ve seen this in a customer’s adopted border collie), not to mention the instinctive attraction of puppies to bones, it’s hard to imagine excluding raw bones from the diet without a good reason. Every month at both stores (Portland and Boston, Fetch and Fish & Bone) we pick a brand of pet food to discount by 10%. The idea is, encourage customers to experiment, or move what we have an overstock of, or just give a good deal because it’s fun. Who doesn’t like a bargain? This month we need to defrost one of the freezers at Fetch and we’re also bringing in Nature’s Variety to Fish & Bone, so all raw food is AT LEAST 10% off, all month. Bigger discounts on full cases, and on some things we have a lot of, like Bravo Burgers & 1- and 2-pound chubs! And we’ll be demystifying raw feeding this month: the benefits, the basics, routines that make raw feeding easier. We’d like to hear from raw feeders out there. Email us if you have experiences, tips or suggestions to share! I’m still reading Dr. Michael W. Fox’s Dog Body, Dog Mind. It’s smart and sensitive, and I think it might have a really profound impact on your relationship with your dog. I just read about touch & the impact of grooming, petting etc. The heart rate goes way down (for the pet-ter too… I wish I could remember the name of the guy who wrote about his Pomeranian’s role in his recovery from traumatic burns. His doctor instructed him to stroke pet his dog for 20 minutes every day to speed healing). Baby animals respond to stroking from the mother by secreting more digestive juices, which kicks in digestion and absorption; and without the nutrients and calories in food, the babies become sick and vulnerable to disease. “Maternal deprivation, or lack of tender loving care, can therefore be detrimental to survival.” p. 56, Dog Body, Dog Mind. ME Organic Farmers & Gardeners Assoc.